Climate change and associated manifestations are creating significant stress in many parts of the world. Increased climate variability especially altered temperature and rainfall patterns, is predicted to be one of the major factors to aggravate the everyday shocks and stressors facing Africa’s growing poor urban populations. Consequently, responding through climate change adaptation must become a central tenet of effective metropolitan governance. This chapter examines the role institutions play in climate change adaptation in Ghana. Empirical findings from an examination of responses to recent floods in Accra (Ghana) are presented. Institutional factors that affect adaptation capacity at the local level, and factors that serve as barriers or facilitate this capacity, were examined. It is suggested that institutions provide pathways for understanding local responses to climate change and strategies for transformative adaptation. Agrawal, A. (2008). The Role of Local Institutions in Adaptation to Climate Change (IFRI Working Paper # W08I-3). Accessed 27 May 2017. Available at http://www.umich.edu/~ifri/Publications/W08I3%20Arun%20Agrawal.pdf. Gasparini, P., Ruocco, A., & Bruyas, A.-M. (Eds.). (2013). 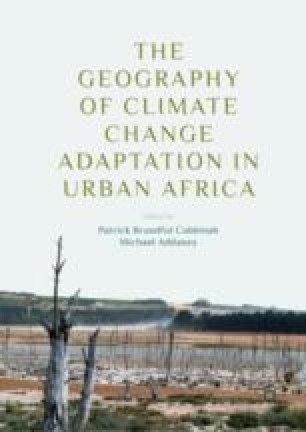 Climate Change and Vulnerability in African Cities: Research Briefs. CLUVA Deliverable D4.5. Available at http://www.cluva.eu/deliverables/CLUVA_D4.5.pdf. World Bank. (2016). The Role of Green Infrastructure Solutions in Urban Flood Risk Management: Urban Floods Community of Practice (UFCOP). Washington, DC: World Bank. Accessed 25 February 2018. Available at http://hdl.handle.net/10986/25112.